My two oldest children are but 15 months apart. They were often accused of being twins as they were close to the same size for many, many years. When my oldest (a daughter) turned 13, she started to make her move, growing more quickly than my son. However, when my son reached 13, he began gaining on his sister. By age 14, he has reached and surpassed her. My question for you today is this: “Are You Growing?” I’m not talking about growing physically. 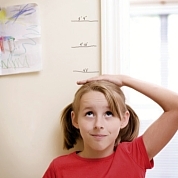 Many of us adults haven’t grown an inch in years. In fact, some of us may have dropped an inch or two in recent years. But, I’m talking about growing spiritually. Peter calls us to grow, “Now for this very reason also, applying all diligence, in your faith supply moral excellence, and in your moral excellence, knowledge, and in your knowledge, self-control, and in your self-control, perseverance, and in your perseverance, godliness, and in your godliness, brotherly kindness, and in your brotherly kindness, love. For if these qualities are yours and are increasing, they render you neither useless nor unfruitful in the true knowledge of our Lord Jesus Christ. For he who lacks these qualities is blind or short-sighted, having forgotten his purification from his former sins” (2 Peter 1:5-9).